Let me begin by setting the context. 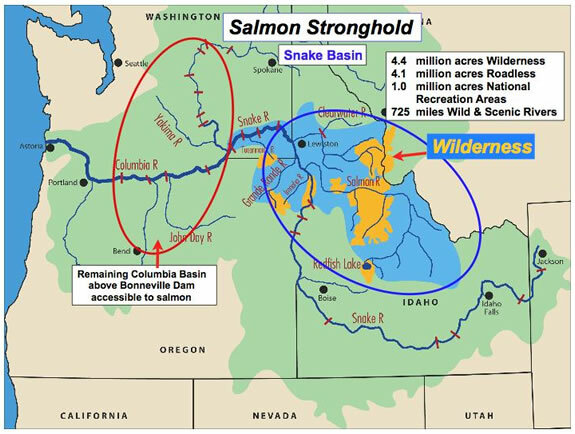 Snake River wild salmon and steelhead are the backbone of the Columbia Basin fish runs. Many residents of the Pacific Northwest do not realize this. The quality and quantity of fish habitat in the Snake River drainage far exceeds that of the remaining Columbia Basin accessible to salmon. The Snake Basin supports about 70% of the remaining habitat for wild spring/summer chinook and summer steelhead in the Columbia Basin. Central Idaho, the most pristine watershed in the lower 48, is where wild salmon and steelhead are born. New eggs are laid for the next generation in clean and productive spawning grounds. Quality riparian habitat supports the nursery areas for growing juvenile fish in an optimum setting. Wild Snake River spring/summer chinook and steelhead historically numbered in the millions. Their populations have decreased significantly since dam counts began in the 1950s (see population graphs). The steep decline is directly related to the construction of four lower Snake River dams between 1961 and 1975. The cumulative impacts of eight dams and reservoirs in the Columbia/Snake Rivers are pushing the fish populations toward extinction. 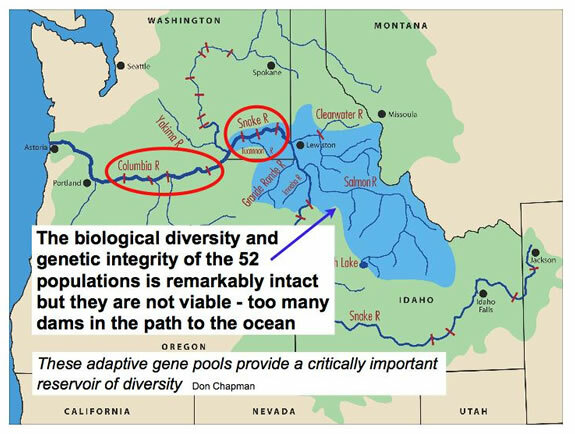 The biological diversity and genetic integrity of the Snake Basin’s 52 major wild populations of salmon and steelhead are remarkably intact. But they can't be sustained because of the fish-killing impacts of Snake/Columbia River dams and reservoirs. The fish runs are not meeting viability criteria (extinction risk) measured by abundance, productivity, spatial structure and diversity as established by federal, state and tribal fish scientists.